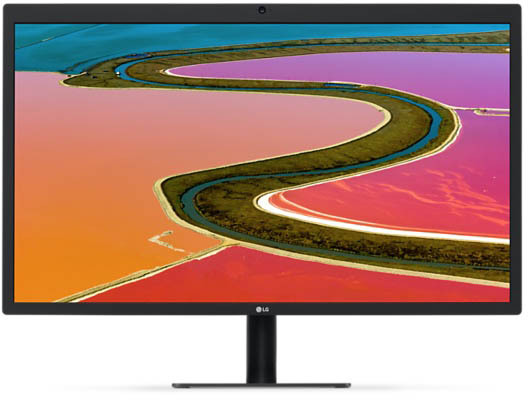 A recurring issue with the LG UltraFine 27-inch 5K display that causes glitches whenever the monitor is placed close to a router will be fixed, LG has announced. Recently, reports began circulating online that LG's 5K monitor – created in partnership with Apple – suffers from flickering and freezing when placed close to a wireless router, with this behavior sometimes causing connected Macs to also freeze and require a restart. On Wednesday, an LG support person confirmed to ArsTechnica that the issue had been reported by a number of users and that it only seemed to occur with the company's Apple-approved 5K monitors. LG has now publicly apologized for the glitch and says all new models made after February will not be susceptible to the problem. Speaking today to Recode, an LG spokesperson said that the company will resolve the problem by inserting additional shielding into newly manufactured models, which should protect against the electromagnetic radiation from routers that is likely causing the issues. "LG apologizes for this inconvenience and is committed to delivering the best quality products possible so all LG UltraFine 27-inch 5K displays manufactured after February 2017 will be fitted with enhanced shielding," the company said in an e-mail. According to LG, existing models will be able to be retrofitted with the same enhanced shielding, allowing the monitors to be placed near routers without playing up. Owners affected by the issue are advised to get in touch with LG support using the number (800) 243-0000, or to visit their local LG seller to arrange for a repair. Apple teamed up with LG to create both the 4K and 5K UltraFine Displays, specifically designed to work with the new 13-inch and 15-inch MacBook Pro. The displays are a successor to Apple's own Thunderbolt Display, which it discontinued earlier this year amid its departure from the standalone display business. The 5K Display is currently available for purchase at the sale price of $974 until March 31, 2017, when the price will return to $1,299.95. Apple was recently falsely accused of hiding negative feedback about the new display on its web store, when the truth was that reviews had not yet been activated for the product page. Whatever the reason for the initial delay, posting to the product page has been possible since January 25 and reviews have so far been mixed. LG's display currently has a 3 out of 5 star rating based on 115 reviews, but it's not entirely clear how many of them are solely affected by the router glitch. A display with no sheilding? I suppose they were trying provide a low cost monitor to the consumer by cutting back on expensive materials like tin. Ahhh...$1,000 for a display that took 5-6 weeks to ship and they expect people to ship it somewhere for repair. Yea right. This should result in an extended return window at any Apple Store. Essentially a recall. And, hopefully this triggers Apple to make their own display and stop suscepting Mac users to the black plastic world of PC users. Nothing like testing a product before release is there! Current owners are advised to wrap the backside in aluminum/aluminium foil. Can you not bring them to an Apple Store? This is probably why people want an Apple branded monitor. They know where to bring it for service. Maybe LG left out the shielding so that screen would be thin enough to meet Apple's standards for thinness. Seems like tinfoil hats can be usefull finally. They **** things up just like Apple, Google, Samsung, Microsoft, Ford, Toyota, Honda, Ikea, etc. All companies make mistakes... cuz people. How they respond to the mistake is what's important. how did nobody notice this in testing? Don't people take these things home for a month to see what actually using them is like?